SHANGHAI--(BUSINESS WIRE)--Youzu Interactive is excited to announce that a yet-to-be-revealed Hollywood Superstar will endorse the turn-based fantasy RPG for Android and iOS, League of Angels - Paradise Land. More than 600,000 players have pre-registered for the game within a week and who will be the angel for League of Angels - Paradise Land is becoming a hot topic among curious players. League of Angels-Paradise Land Trailer: Guess who she is? “She personifies beauty, strength, power and grace, which make her the perfect endorser for the League of Angels universe,” said Liu Wanqin, Head of GTarcade and Vice President of Youzu Interactive. “We would like to invite our community to try and guess who is this mysterious superstar! 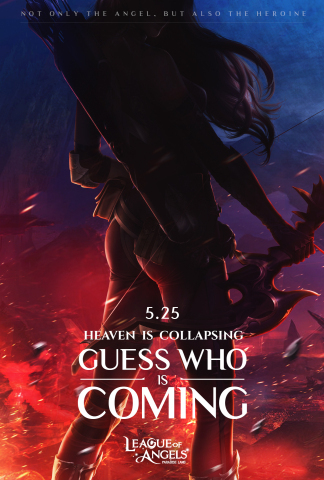 Here are two hints: she is a movie star, and she is seen as a superheroine.” The answer will be revealed with the upcoming global release of League of Angels - Paradise Land. Scarlett Johansson, Angelina Jolie, Gal Gadot, Zoe Saldana, and many other famous actresses have created quite a number of images of wonderful superheroines. As for League of Angels - Paradise Land, instead of creating “glassy-eyed dolls and extensions of the main male character”, the dev team has always being trying to make angels of flesh and blood, and find the right celebrity to endorse them. The story of Paradise Land takes place in the world of Elysium, where a nefarious power has toppled the rule of the Angels. The strife between the Humans, Elves and Orcs has become intensified even more. Legend says only the "Omega," an ancient relic of the Angels, has the power to alter the grim fate of the world and prevent its end. With a senior art director from GTA5 overseeing the game's design, players can expect beautiful 3D graphics and dynamic scenery to bring the game to life. Paradise Land also provides a unique and innovative RPG experience through multiple progression paths and a wide variety of gameplay modes, such as a dual-resource combat system. League of Angels - Paradise Land is the latest mobile title in the League of Angels series. Its predecessor League of Angels 2 has been named one of Facebook's Best Web Games of 2016. Guess who will be the spokesperson and join the Global Pre-registration event! Youzu Interactive is excited to announce that a yet-to-be-revealed Hollywood Superstar will endorse the turn-based fantasy RPG for Android and iOS, League of Angels - Paradise Land.